St. Augustine’s St. Francis Inn, a great place to stay! On a recent trip to St. Augustine my husband Keith and I had the pleasure of staying at the beautiful St. Francis Inn that has the distinction of being the oldest inn in America. How cool is it to be staying in the oldest city in the US, at the oldest Inn around the corner from the oldest house? 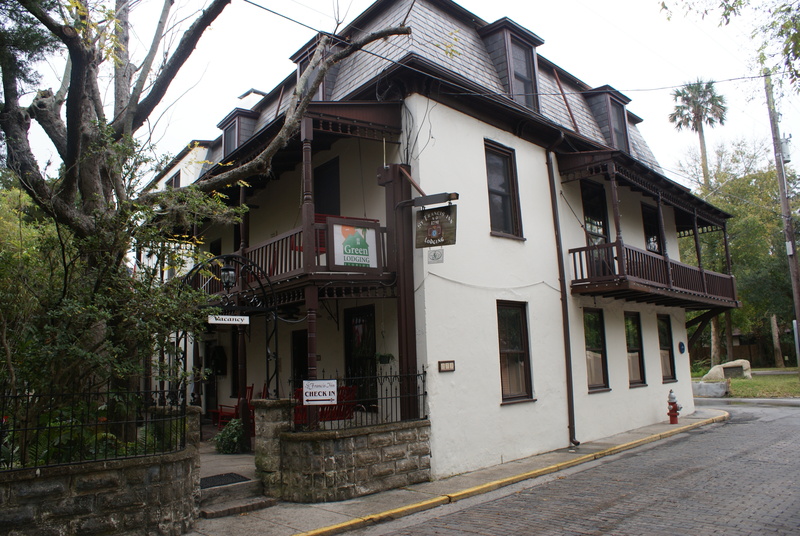 Located in the historic area of the city, the St. Francis Inn is near all of the sites. This allowed us to walk and enjoy the beautiful Mantanza Bay but yet when we returned to the hotel we were far enough from the hustle and bustle to away to enjoy the private retreat that those like my husband that prefer. Walking or taking the trolley is the best way to get around St. Augustine since the streets are narrow and there are not many places to park. After traveling by car this was one of my favorite things about the city, getting out of the car and immersing ourselves in the city that this year celebrates 450 years! The St. Francis Inns dates back to 1791 during the Second Spanish Colonial Period. When the house was first built it was built as much for protection as comfort. The King of Spain declared all houses were to “serve as a defense of fortress against those who might attempt to occupy the town”. Because of this decree, the building stands directly on the street with the entrance in the lovely courtyard. The first owner Gaspar Garcia was a military man, next was a sea captain Juan Ruggiers. The Ruggiers family owned the house until the American rule of Florida. Various owners lived in the home until in 1839 Colonel Thomas Henry Dummett, who had grown up in Barbados retired from the British Marines and began a sugar plantation, but left after slavery was banned coming to America he bought land south of St. Augustine to set up a sugar mill plantation and developed a rum distillery. After his death, it was his daughter Anna that never married who converted the home to an Inn. The history of the house makes this such an interesting place. We excited to be staying in a place with so much character and beauty nestled in the heart of Saint Augustine Antiqua, the restored historic district. The Inn offered a base to see the sights after fortifying us with an amazing gourmet breakfast that was different every morning. After touring all day we would head back to the St. Francis Inn arriving just in time for the evening social hour where they offer drinks and light snacks. We lucked out and had great weather during our stay and enjoyed sitting out in the patio and getting to know some of the other visitors. The day ended with the nightly homemade desserts offered by the wonderful St. Francis staff. Thank goodness we walked a lot on this trip or we would not have fit back in our car!